Just bought it and went to install it on a VESA mount and one of the screw holes stripped while inserting the screw, and then later broke.Other than the shady build quality, screen looks great and great video quality. You get 100% what you would expect out of this monitor. Good color, response time, etc. 24 inches is a great size.The buttons to control the monitor are in a terrible place. (Behind the monitor where you cannot see) Monitor also takes a good ~10 seconds to boot and show the output. (On HDMI)Speakers are weak, my smartphone are louder and more clear.Mine did come with 1 dead pixel, but that is just my luck. Really happy with the monitor. Goes beyond what I was expecting when it came to displaying. Ports facing downwards makes it annoying to plug inputs in without laying the monitor down flat. Cons: Only includes a VGA cable. Higher-end monitors like this should come with a DVI cable. The shiny base is a scratch and fingerprint magnet. Pros: Good response time, decent brightness and a fair price (especially on sale). This monitor is quite decent for what you pay; the colours are nice (obviously not as good as an IPS display, but you can't get those in these response times) The only legitimate complaint that I have is that this monitor DOES NOT come with a DVI cable- which makes honestly no sense. DVI cables should come standard with any monitor above $100, especially if you plan on using it for gaming.As a personal preference, I hate glossy bases. They are prone to getting scratched up, and attracts dust worse than a magnet attracts iron shavings. I would have preferred if it were matte black.All in all, I am only taking a star off for the lack of a DVI cable. Sorry, BenQ, but it should be standard. I'm a simple guy wanting a good and reasonable priced gaming monitor. I don't need fancy specs with the Samsung and their IPS PLS panel stuff along with other brands. I'm loving this monitor, plug and play, and easily installation. great price for a screen. would buy again. The HD gaming has been really awesome esp. with newer games and the 2 ms refresh is decent enough for FPS's. 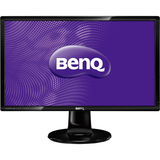 I also have the Pro gaming League Benq RL2455HM, and i like this one better. Would buy again.